Master omnichannel service. Triple customer retention. When you give customers a choice about how to contact you -- digital, voice, or online -- you are well on your way to creating a superior experience. Embrace omnichannel and watch your customers become loyal brand advocates. 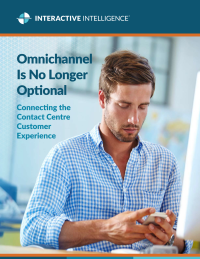 By creating real-time visibility into all interaction types — including digital and phone — call centre agents and supervisors can create customer experiences that are streamlined, simple, fully informed, and effective. They can ensure customers are recognised regardless of their initial contact channel, they can anticipate that customers may begin in one channel and move to another as they progress to a resolution, and they can deploy technologies to make the transition between channels as convenient and enjoyable as possible. Download the eBook for the big story.